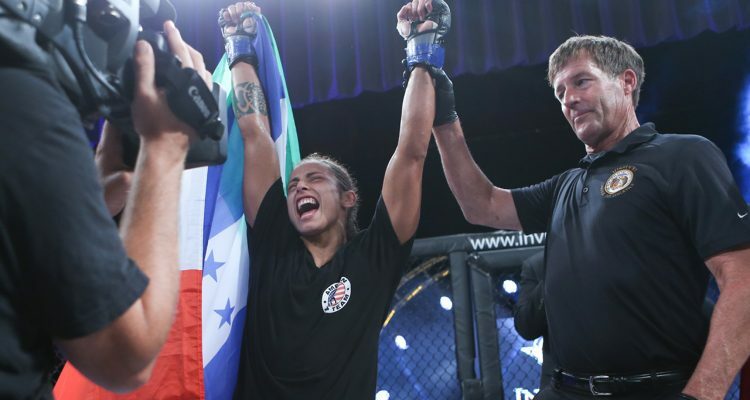 Invicta FC 24: Dudieva vs Borella (photos) » MMA H.E.A.T. On Saturday, July 15, Invicta Fighting Championships hosted Invicta FC 24 from the historic Scottish Rite Temple in Kansas City, Mo. The seven-fight card streamed live and exclusively on UFC FIGHT PASS. 1, 2 Sorenson and Coleman each missed weight for their respective featherweight bouts and were fined 25 percent of their purses. Both bouts will proceed at catchweight. Invicta FC 24 was originally scheduled as an eight-fight card, but a strawweight bout between Mallory Martin and Tiffany Masters was removed from the fight card due to medical issues. No Comments on "Invicta FC 24: Dudieva vs Borella (photos)"